"Ground Zero". Arayo and I stand on the beautiful white sand beach and imagine this scene 5 years ago when Hurricane Katrina came to town, leaving death and destruction in her wake. A beautiful beach-side community, pummeled by winds and waves so strong as to flatten homes and send anyone foolish enough to try riding out the storm to a very vicious death. Do we know how to to have a good time on the road, or what? Dubbed by USA Today as "The Town that Vanished", Waveland, MS, is no stranger to impressive storms. This coastal community spent a decade recovering from the damage that Hurricane Camille wrought on it in 1969. Then, when Katrina reared her head in 2005, bringing along a 33 foot storm surge, she made sure that this town, which sat in the center of her path, would feel her might. Pre-Katrina Waveland was a quaint sea-side community of about 6,000 people but most of the roads leading through town take us past blocks and blocks of emptiness. A few lots sport "For Sale" signs and the homes that have rebuilt are elevated - no doubt fortified by impressive steal reinforcements. Most of the remaining trees are enormous, with branches massive and strong. Though many bear scars of limbs decapitated in the 140 mph winds, they stand, a testament to the endurance of nature. A water-front church sports a sign proudly advertising that no storm, no matter its power, can stop them from proclaiming their glory to God. I wonder how God takes this - rebuilding on this scene of destruction? "Come on, Big Boy - hit us again! We can take it!" Time will tell how Waveland rebounds. If the lure of living near the beauty of the beach make people risk the might of yet another major hurricane or if many have said "uncle" and made a permanent move to less risky lands? 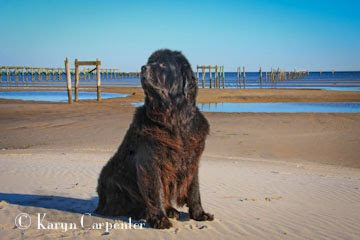 Photo: Arayo enjoys the ocean breeze - no doubt sniffing if another Hurricane is drawing near.